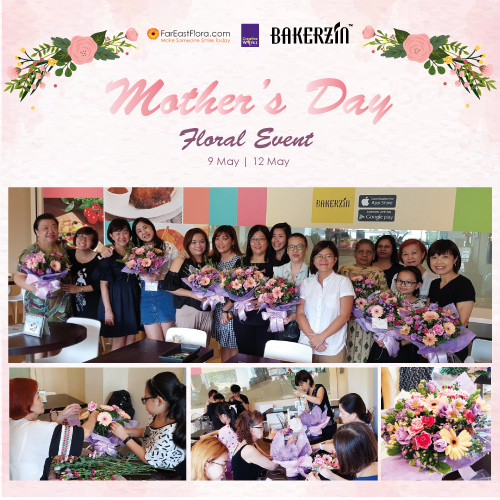 Monday | May 14, 2018	During the Mother’s day period, Bakerzin and Far East Flora have gathered families for a fulfilling and meaningful bonding session. The two mentoring session covers hands-on floral arrangements by the participants and their mummy. Far East Flora trainer has also shared the history of Mother’s day, symbolism flowers and valuable floral care tips during the session. Thereafter, families are treated to Bakerzin’s sumptuous tea time set on Wednesday and 3-course meal on Saturday. The family members then presented the flowers to their mother at the end of the fun and jovial workshop, which shows their appreciation for all the love they have been showered over these years. We would like to thank all the mother’s all over the world for their everlasting love for their family!